At 788 feet of vertical elevation, the Columbia Center in downtown Seattle is one of the tallest buildings west of the Mississippi. It takes 69 floors, or 1,311 steps, to reach the highly acclaimed Sky View Observatory with breathtaking views of the entire Puget Sound region. 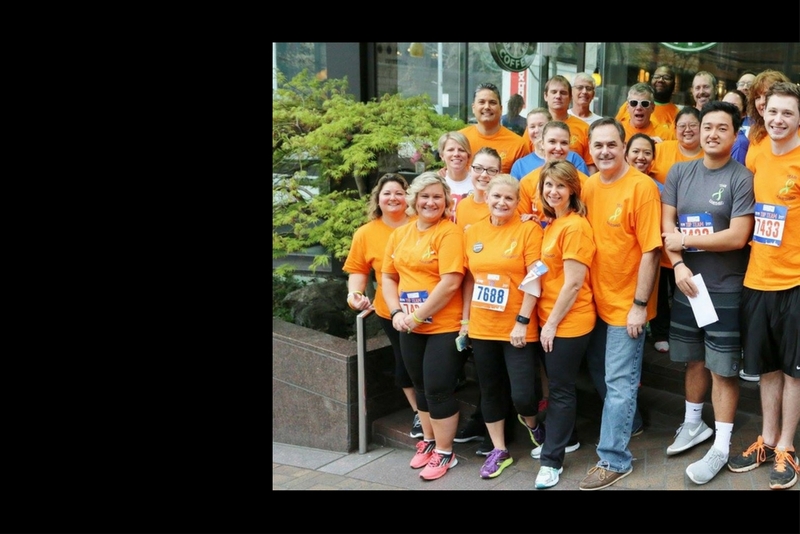 The Leukemia & Lymphoma Society's Big Climb event raises money through individual and team fundraising, sponsorship and entry fees which is then invested in its mission to fund blood cancer research and support services for patients and their families. In 2018, the Big Climb raised a record breaking $3,007,080. Big Climb Seattle will be taking place on Sunday, March 24, 2019. The mission of The Leukemia & Lymphoma Society (LLS) is: Cure leukemia, lymphoma, Hodgkin's disease and myeloma, and improve the quality of life of patients and their families. BEATING CANCER IS IN OUR BLOOD. What is the 501(c)3 Tax ID number for the Leukemia & Lymphoma Society? You can register by clicking here. There is a $50 registration fee to sign up for Big Climb 2019. Big Climb 2019 is open to participants 8 years of age or older. When is early bird registration and did I qualify? Early Bird Registration (for those who raised $1,000+ in Big Climb 2018) will open at 9:00 am on Tuesday, September 11 and will run through Thursday, September 13. Those who qualify will receive an exclusive link to register the week prior to early bird opening. Registration opens at 9:00 am on Friday, September 21, 2018. Can team captains sign up team members? If they are participating as a climber or racer. It is very important that you know their email address (and do not put your own in) as putting your email address will keep them from receiving important event updates and login information. Please note, if registering other participants, you will be required to pay their registration fee. What is a racer and a climber? Racers: All participants will be timed in both stairwells at Big Climb 2019. Racers are those who can finish the climb in 20 minutes or less. Climbers: All participants will be timed in both stairwells at Big Climb 2019. Climbers are those who are ready to conquer the stairs at their own pace. I didn’t raise the minimum last year, can I climb this year? If you were a participant in the Big Climb 2018 and didn't reach your fundraising minimum by the fundraising deadline, you will not be allowed to participate in Big Climb 2019. Still want to participate? You must donate the required $150 when registering for Big Climb 2019 or you will be unregistered. How long will it take for gifts to be processed and counted towards my fundraising total? Online donations are processed automatically and immediately applied to your fundraising total. Gifts made by check or money order will be processed and applied to your fundraising total within 48 hours of being received by the LLS Washington Alaska chapter office. How do I know if my company has a matching gift program and how do I use it? Many companies have programs that match the charitable contributions of their employees. This can double and sometimes triple the amount of a donation, at no additional cost to the employee—a great way to increase your impact! Matching gifts will not be posted until all necessary, completed paperwork and funds have been received from both the employee/company and LLS Washington Alaska Chapter. LLS tax id number will be required: 13-5644916. If you have questions, please reach out to matchinggifts.pnw@lls.org. Is there a mandatory fundraising requirement? Yes. All participants ages 18 and older are required to fundraise a minimum of $150. All participants under the age of 18 are required to fundraise a minimum of $100. This is in addition to the registration fee. Registration fees are non-refundable once you have registered for Big Climb Seattle. You can make a donation to an individual or a team here. What is required to be a VIP climber? All participants that raise $2,500 or more qualify as VIP climbers. VIP participants have a designated area on event day where they will receive a special gift and catered food. What is the Summit Club and Elite 30? The Summit Club is a reserved area for the top 15 teams. The teams that qualify must raise the most in one of three categories by 11:59pm on March 21, 2018. The top 5 overall fundraising teams, the top 5 small per-capita teams, and the top 5 large per-capita teams will receive a spot in the Summit Club, where they will receive special gifts, catered food, and a designated area for their team to gather and hang out on event day. How are team donations handled? Team donations are equally divided amongst the team members after the event. This amount will be added to individual fundraising amounts to come up with participant totals, and will count toward qualifying for incentive prizes. Team donations will not count toward Elite 30 member totals. Please note, team donations are separate from the mandatory fundraising minimum. What are fundraising incentives and how do I qualify? Big Climb holds fundraising competitions posted on social media and in the monthly newsletters leading up to the climb. Participants can collect donations during these competitions for a chance to win prizes. How do I get my team name on the back of event day t-shirts? Any team consisting of 4+ participants that raise $15,000 or more by March 1 will get their team’s name on the back of all 6,000 participant t-shirts! Yes. As of Big Climb 2019, all participants will be timed. Please see information on racers and climbers in the registration section of FAQs. Free parking is available for all event participants and volunteers at the Columbia Center. The entrance to the parking lot is located on Columbia Street, between 4th and 5th Avenues. Please be aware that you may be directed to another overflow parking garage nearby. 30-45 minutes prior to your assigned start time. Please take in to consideration the time it will take you to find parking. Where is the Summit Club / VIP area? Summit club/ VIP area is located on the second floor of the Columbia Center. On event day, the first floor of the Columbia Center will have Check-In, Bag Check, T-shirt pickup, and sponsor/vendor booths. Additionally, this is where you will start lining up for your assigned start time for both racers and climbers. The second floor is for Summit Club / VIP members only. Third floor is volunteer check in. The fourth floor is where participants will enter the stairwell! Be prepared to get your start line photo taken here. While in the stairs, there will be 5 water stops, fans, and all of our participant’s dedication signs as you climb the 69 floors to the top. After crossing the finish line, you will be able to take in 360° views of the Puget Sound at the newly renovated Skyview Observatory before going to the 40th floor to fuel up and recover. Can my friends and family wait for me at the finish line? No. Due to space limitations, no spectators are allowed at the finish line. Friends and family are welcome to wait at the Atrium level. How do I request a dedication sign? You can request a dedication sign here. Please complete this form each year you participate. How are start times assigned and when will I receive my assigned time? Start times are assigned based on fundraising standings. Approximately 100 participants will be assigned per start time and per stairwell starting at 8:30 a.m. Start times are spaced 15 minutes apart (8:30 a.m., 8:45 a.m., 9:00 a.m., etc) with the last start time at 4:30pm. Start times will be emailed to all participants 2 weeks prior to event day. Can I bring anything into the stairwells with me? No. With limited space in the stairwells and the risk of dropping something, we cannot let anything into the stairwells. This includes, backpacks, camelbacks, baby backpacks, etc. There will be 5 water stops throughout the race, so bringing a water bottle is not necessary. Please drop off all items at bag check before your start time to avoid being sent back down with your items. Will I get an event t-shirt? Participants that raise the fundraising minimum before or on event day will receive an event t-shirt! The fundraising minimum is $150 for adults 18 and older, and $100 for those between the ages of 8 and 17. You may pick up packets for your friends, family and teammates. Teams of 10 or more will be packaged together in one large envelope: one person is responsible for picking up all of these packets (for teams 10+) together. As a reminder, you still have the opportunity to pick up packets on event day. Please note: Any switches between racer/climber or participant substitutions must now be made at packet pick-up or on event day at the Swaps/Changes table, and will require a $10 fee ($15 fee if changing from climber to racer). Changes at packet pick up and on event day are not guaranteed.